I have had this post queued up and ready to go for the last two weeks. Two. Weeks. The problem is, two weeks these days feels more like two hours. Time is flying faster than Harry Potter chasing the golden snitch. (Can you tell that my Thanksgiving plans include a trip to The Wizarding World of Harry Potter? That's pretty much all I can think about in between shooting and editing and shooting some more.) These biscuits were meant to welcome November and the sweet potato madness that comes with it but, instead, they're being offered up as a potential Thanksgiving morning breakfast. That works too, right? I think it is a brilliant idea. Imagine Thanksgiving morning: the too-early wake-up call, the hours of cooking laid out in front of you, the stress of making sure the turkey is cooked just right. Now, picture the container of freshly (as in the night before) baked biscuits waiting for you as you start the coffee. The thin slices of salt-cured ham in the refrigerator. The pairing of that salty ham with those barely-sweet biscuits, which are easy to hold in one hand as you pull out celery and carrots and onions for chopping. Not bad, right? Make it come true, friends. Take a bit of time Wednesday night to whip up these beauties so they'll be ready to fuel you Thursday morning. You'll be oh-so-glad you did. Preheat your oven to 425℉ with the rack in the middle. Prick the sweet potatoes in several places with a fork, then bake on a baking sheet until very tender, 1 to 1-1/4 hours. Cool slightly, then halve lengthwise and discard skin. Purée sweet potato in a food processor. Transfer 1 cup purée to a bowl (reserve any remainder for another use) and stir in milk. Chill until cold, about 30 minutes. Preheat oven to 425℉ again. Grease a large baking sheet or line with parchment paper. Whisk together flour, sugar, baking powder, and salt in a large bowl. Blend in butter with your fingertips or a pastry blender until mixture resembles coarse meal. Add sweet potato mixture and stir just until a dough forms. 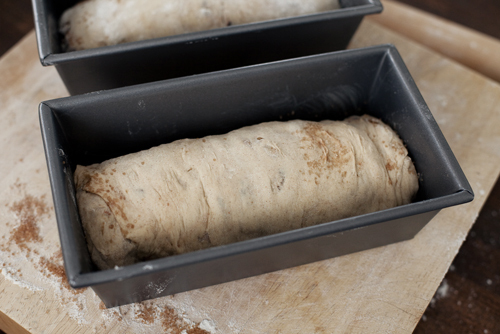 Drop dough in 10 equal mounds onto greased baking sheet, spacing them 1-1/2 inches apart. Bake until lightly browned and cooked through, 18 to 22 minutes. Transfer biscuits to a rack to cool. I hold a firm belief that berries + citrus are one of the best combinations ever. Right up there with caramel + sea salt, peanut butter + banana, tomatoes + pasta. It's a shame that their seasons are opposite each other, with citrus at its height mid-winter and berries abundant mid-summer. That won't stop me, though. 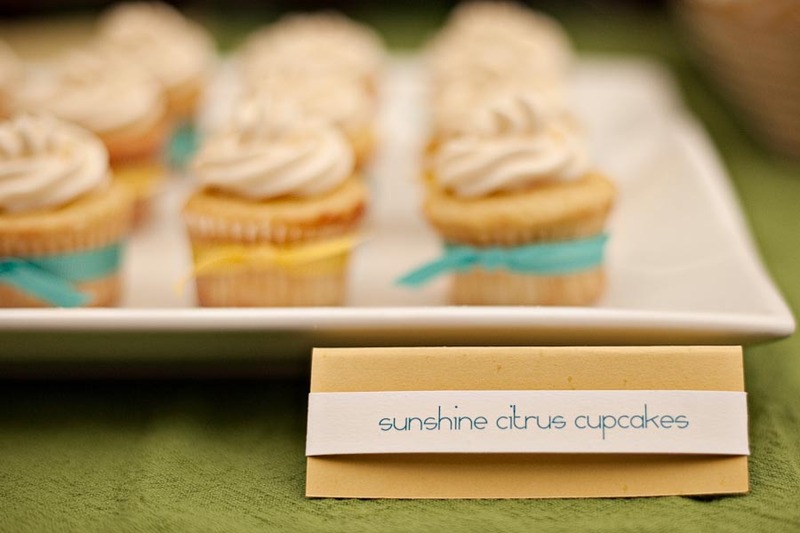 Be it berry jam, cobbler, tart, or muffin...it will involve lemons, limes, or oranges. Also, I am a big fan of scones. If they are the right scones, that is. No dry, crumbly, lumps that turn to paste in the mouth for me. I like them softer; closer to the product of a marriage between scone and muffin. Easy to grab and eat in the car on the way to work, without the spray of crumbs across the lap when you arrive. These particular scones, made moist with buttermilk and bright bursts of blueberry, still hold a hearty texture thanks to the white whole wheat flour. I like to think that makes them a healthy breakfast treat, even if all that whole grain goodness does is cancel out the sugary glaze drizzled over top (shhh...just let me have that...please?). If you'd like an even fluffier texture, substitute all-purpose flour for the white whole wheat. And be careful not to overmix your dough, keeping in mind the same principles applied in biscuit-making...work fast and keep your ingredients cold. Happy Monday, friends! Have a lovely week. Although they are best day-of, these scones can be stored in an airtight container for up to three days. Preheat oven to 375*. Spray a baking sheet with oil or cover with parchment paper. Mix buttermilk with egg and extract in a large bowl. Add flour, baking powder, lime zest and salt to a large food processor. Pulse until blended. Add butter and pulse until mixture resembles course bread crumbs. Add sugar and pulse again until blended. Add flour mixture to egg mixture and stir with a wooden spoon until a soft dough forms. Do not overmix. 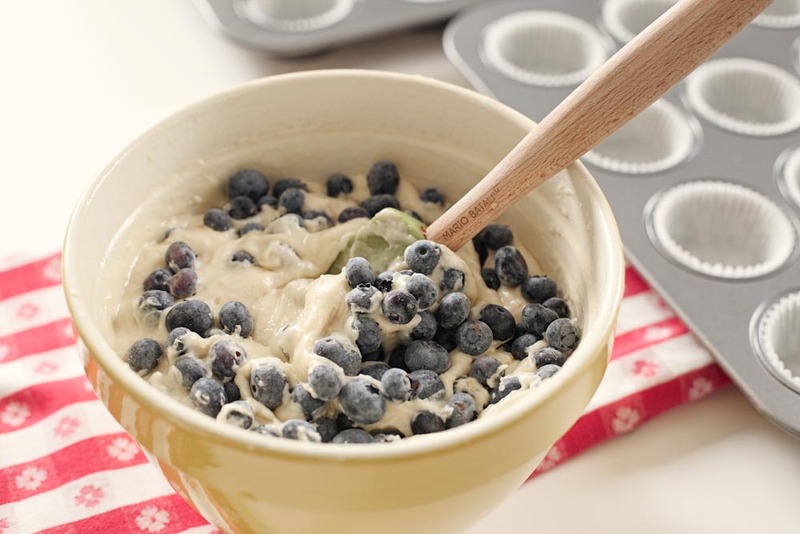 Add blueberries and carefully fold them into dough. Turn out dough on a floured board and give 5-6 careful kneads, just until well mixed and cohesive, trying not to crush too many of the berries. Divide dough into 8 equal pieces and roll into balls before flattening into disks about 4 inches wide. Bake on prepared baking sheet for 20-25 minutes until medium brown. Let cool on sheet for 5 minutes before moving to wire rack to cool completely. 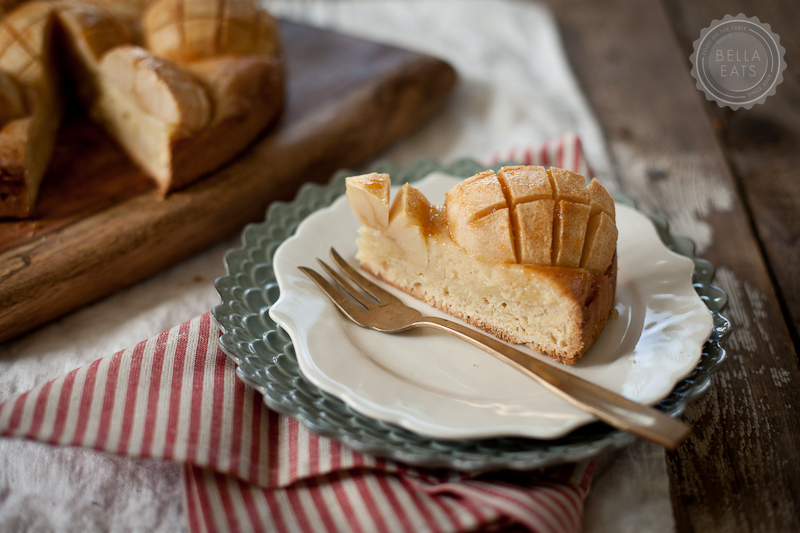 To make the glaze, mix the confectioner's sugar with 2 tsp of lime juice. Use a spoon to blend together into a paste, adding more lime juice a bit at a time until the glaze is spreadable. I'll admit...I've shared this recipe before. It was a long, long, time ago, way back in the first few months of Bella Eats' existence. 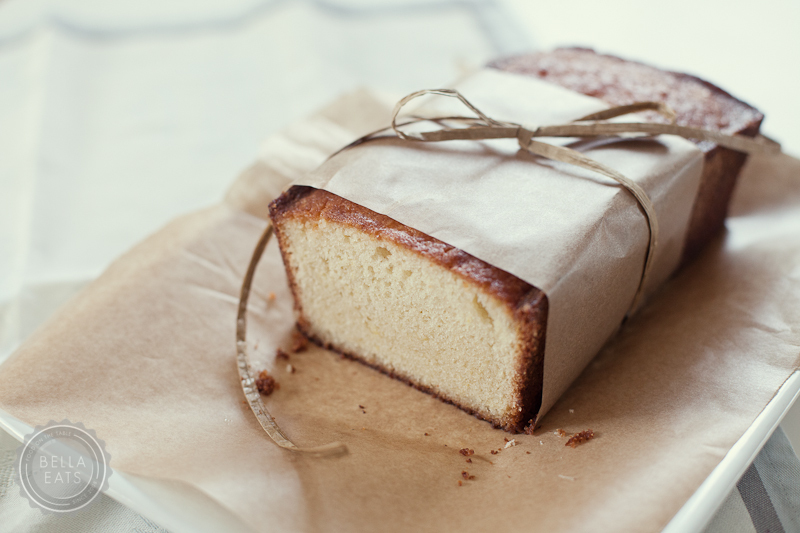 I claimed then that this was the best quick bread I'd made...ever. And now, 2 years and many loaves later, I'm sticking to that statement. This recipe is at the tippy top of my list of favorites, loved so much that the old photographs just didn't do it justice. And so, when the baking urge hit me mid-afternoon last week (as it does most afternoons these days) I decided to capture new images of this old friend. I love the melded scents of banana and cinnamon punctuated by sweet dates, which take on an almost caramel flavor. Diced apple keeps the bread wonderfully moist while adding its own, very subtle, sweetness. Made without oil, with whole wheat flour, and sweetened naturally, it is not absurd to have several slices of the loaf in one sitting without feeling guilty. 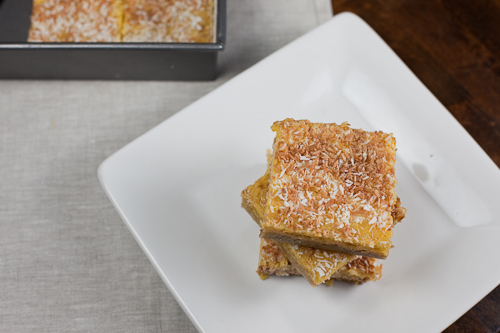 Add a smear of almond butter to a thick slab and you have quite the hearty and filling breakfast or afternoon snack, while a quick zap in the microwave and a thin sliver of butter make for a lovely not-too-sweet dessert. If you've been around since the beginning and already added this recipe to your repertoire, you might notice that I've made a small change in the ingredients. Instead of the 1/2 cup of applesauce previously present, I've substituted non-fat Greek yogurt. I've found that the overall texture is improved and the bread has a better, more shapely, rise. This loaf freezes quite well for up to 3 months if wrapped tightly in plastic wrap and again in foil. Preheat oven to 350*F. Grease a 9x5 loaf pan. In a large bowl, combine the bananas, yogurt, sugar, egg, apple, and dates. Add the dry ingredients to the wet and stir until just combined. Pour batter into prepared pan. Bake for 45-55 minutes, until a toothpick inserted into center of bread comes clean. Cool in pan on rack for 10 minutes. Remove loaf from pan and cool on rack completely before slicing. Hello. My name is Andrea. I write this food blog, Bella Eats. You may remember me, or due to my long absence you may not. I’m sorry about that, truly I am. I miss this space! Life has been busy. So so so busy. I started teaching architectural design at the University of Virginia. Teaching. At a University. !!! And before that teaching officially began there was training for teaching. And in the middle of all of that I photographed the wedding of a dear friend I’ve known since the fifth grade. Fifth grade! She was such a beautiful bride, and if you’re interested in seeing some of those images please check out the AHPhoto blog. Oh, and I started a photography business. Because I love taking pictures of people. And buildings. And food. So if you know anybody who needs somebody to take pictures of people, or buildings, or food...feel free to send them my way. I’d appreciate it so so much. And thank you, all of you, who have commented and tweeted and emailed your support. You’re the best, truly. And yes, I am still working for an architecture firm here in Charlottesville. So...yeah. Busy. It feels as though summer has completely passed by Bella Eats. 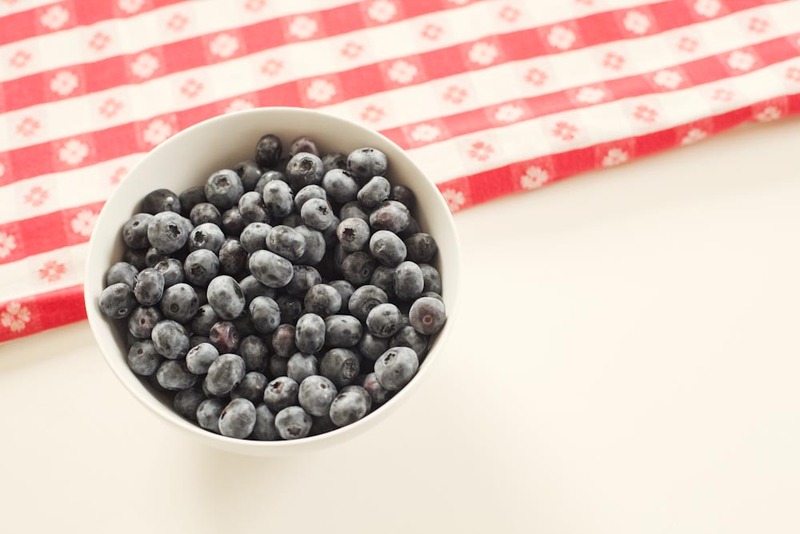 Since June I’ve posted about cherries, blackberries, and blueberries. There have been no luscious heirloom tomatoes, no juice-laden peaches, no golden ears of corn. I even have a new trick for releasing kernels from their cob without making a complete mess of the kitchen counter and floor, and I haven’t had the opportunity to share it with you. That is sad my friends, because this trick is a good one. It will change the way you view corn entirely. Soon, I hope. Way back in the middle of July our dear friend Kristin celebrated her birthday. 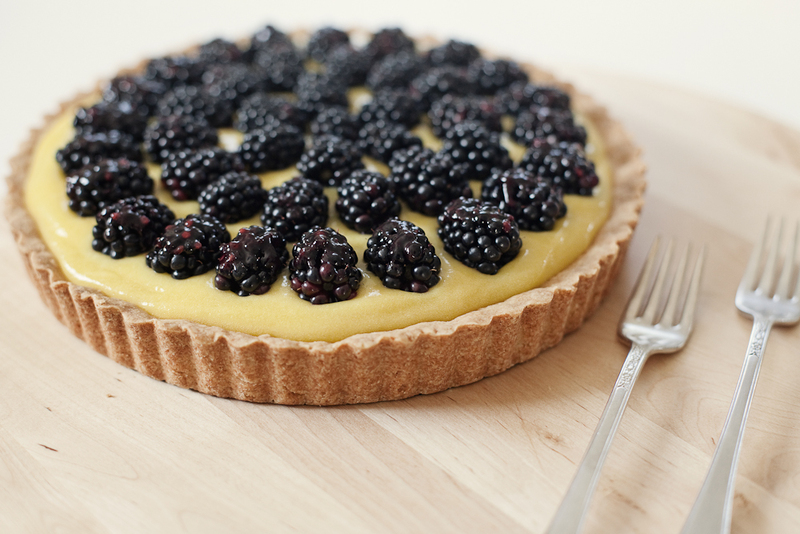 She celebrated with us, and with this lime tart topped with blackberries from our garden. 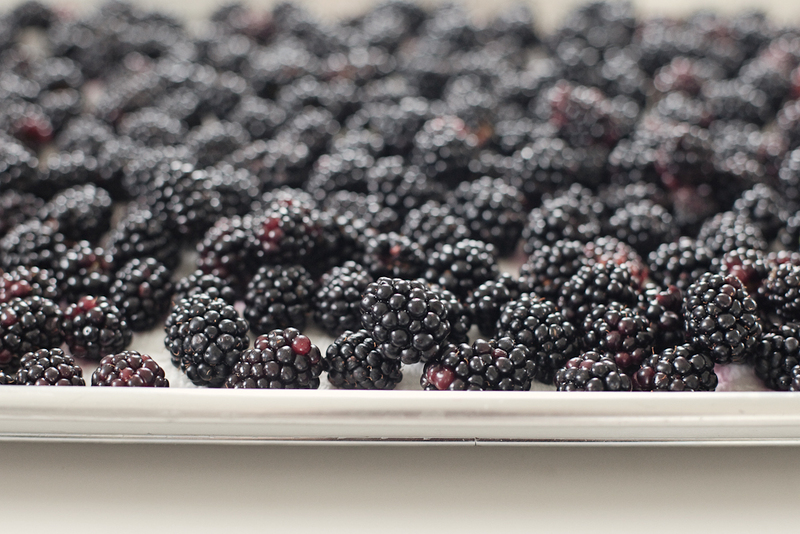 Blackberry season is just about over, a sign that summer is drawing to a quick close. Our bush has shed it’s bounty completely, leaving only the tiny shriveled berries that didn’t ever come to full ripeness. 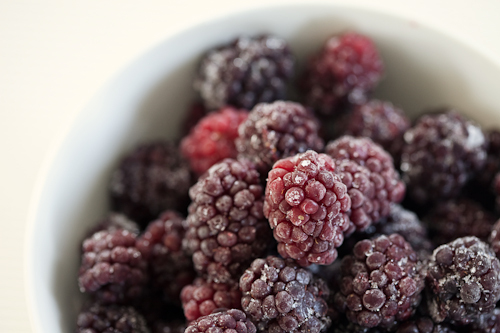 Our freezer is packed full of quart-size bags of the frozen fruit, our pantry shelf stocked with various forms of blackberry jam. This tart was one of the last recipes made this summer using berries fresh from the garden, and looking at these pictures already has me feeling nostalgic. What is it about food that stirs memories stronger than those evoked by any other sense? While blackberries don't take me back to any point of my childhood, they do plop me down solidly in our backyard here in Charlottesville. 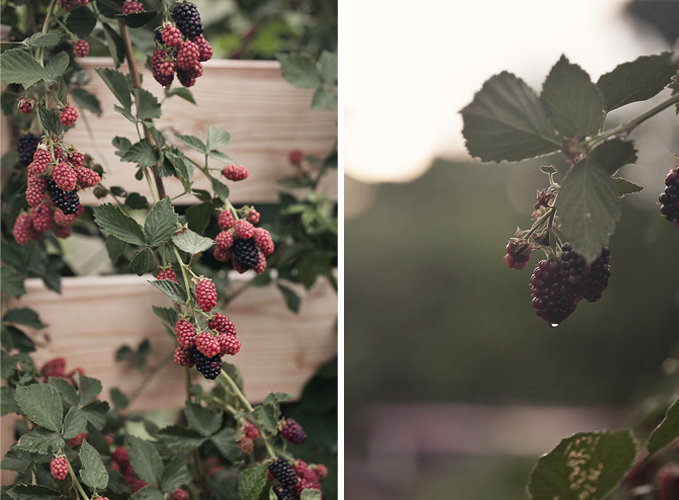 For the past 4 years we've spent countless July and August evenings standing in our garden, bowls in hand, fingers stained purple, arms eaten by mosquitos, quietly and contently plucking berries one-by-one from a bush WE planted. I know that forever, no matter where we are, when I pop a freshly picked blackberry into my mouth I will be transported back to this place. I love that. If you’re lucky you can still find pints of deep purple blackberries at your local farmers’ market, and if you do, I recommend you make this dessert before summer's end. The crust is quite perfect, nearly the consistency and flavor of a shortbread cookie. It doesn't flake and melt in your mouth like many pastry shells, but instead offers a firm vessel on which to carry a scoop of zippy lime curd. 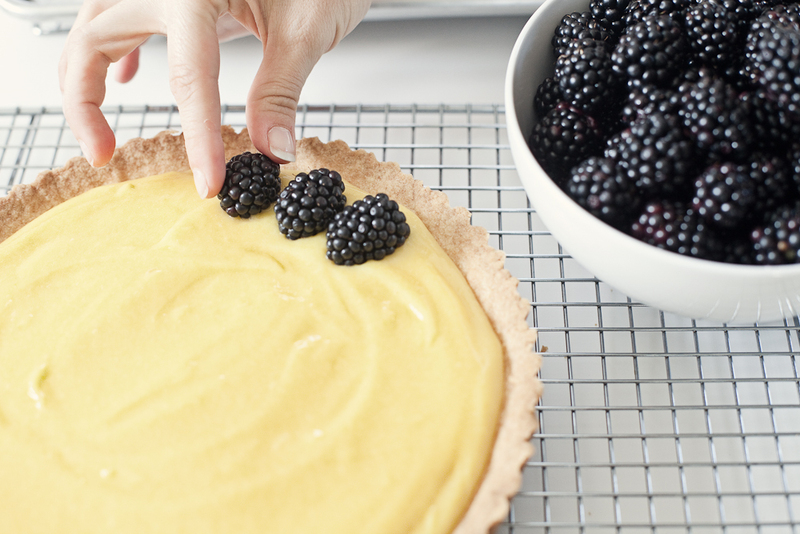 And scoop you will, because this tart never really sets up to a solid, sliceable state. Which is fine by me. The delightful combination of sweet shortbread, tart curd, and fresh blackberries had us all going back for seconds, despite our use of a spoon rather than a fork. For the record, I am so unhappy with the spacing that this new Wordpress theme defaults too, but I just haven't had the time/energy to dig into the CSS code to fix it. 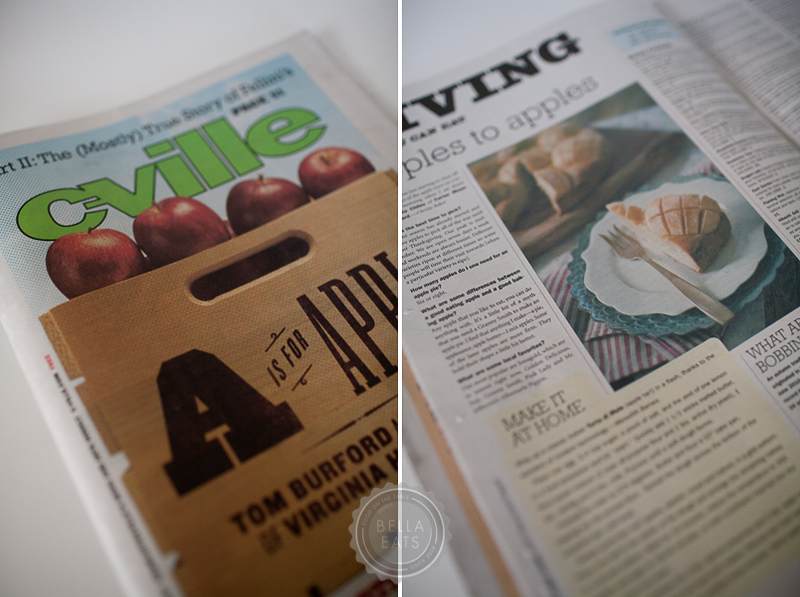 And, we're working on a redesign of Bella Eats to be launched right around the two year (two years!) anniversary of this site at the end of October. So, please bear with me and the awkward/awful spacing of the text in my recipes... Thank you. Set a fine metal strainer over a medium bowl and set aside. Whisk the eggs, egg yolks, and sugar in another medium metal bowl to blend. Whisk in lime juice. Set bowl over large saucepan of gently simmering water (do not allow bottom of bowl to touch water). Whisk constantly until curd thickens and an instant-read thermometer inserted into curd registers 178ºF to 180ºF, about 6 minutes. Immediately pour curd through prepared strainer set over bowl. Using an electric mixer, beat the butter and sugar in a medium bowl until well blended, 1 to 2 minutes. Add egg yolk; beat to blend. Add flour and salt and mix on low speed until mixture resembles large peas. Using hands, knead in bowl just until dough comes together. Preheat oven to 350ºF. Uncover crust and bake until golden brown, about 35 minutes. Cool completely in pan on rack. Remove sides from tart pan and place crust on plate. 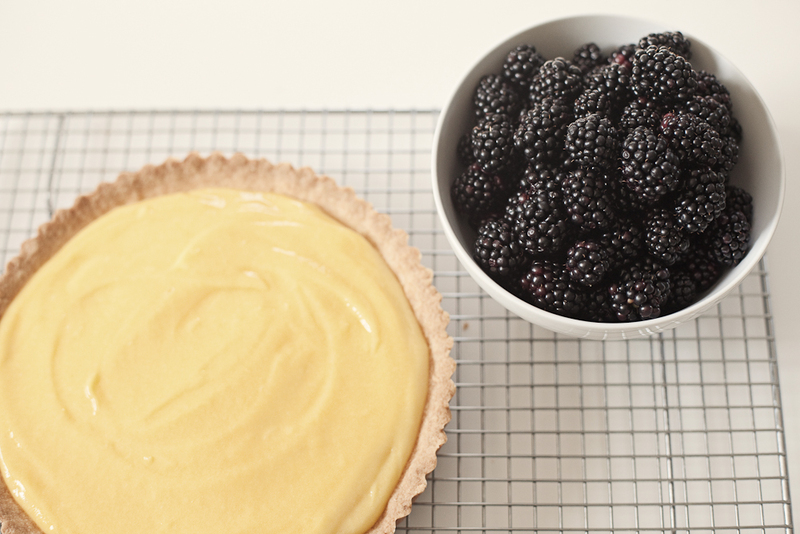 Spread lime curd evenly in baked crust. 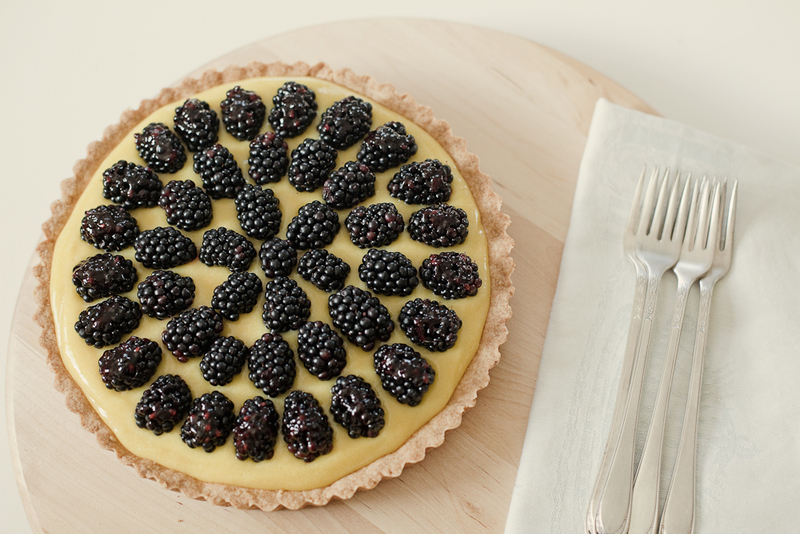 Arrange blackberries in concentric circles on top of tart. ***Tart can be made up to 8 hours ahead. Chill uncovered. Last year at this time I was posting regularly about our backyard vegetable patch. I’d shared potato salad with our sugar snap peas, an earthy, herby frittata, and a rosy beet risotto. The garden was, while a bit overgrown, orderly and walkable. I visited it every day, scurrying through the gate in the morning after my runs to pick raspberries for breakfast, losing myself to daydreams as I stood with a hose each afternoon and soaked the soil under the tomatoes and peppers. I was oh-so-proud of our little plot, and oh-so-excited to share its progress with you all. 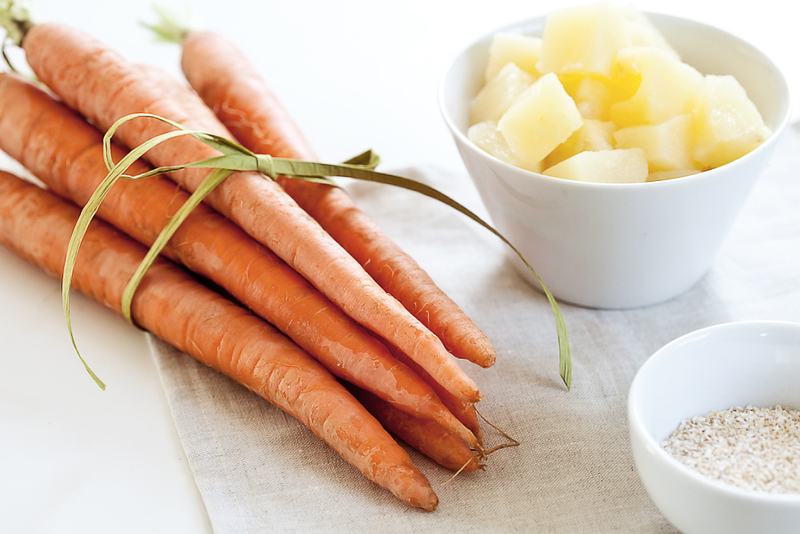 In December, after harvesting the last of the carrots for our Christmas dinner, Brian and I mourned the fact that those were probably the last vegetables we’d see come from our current backyard. We were planning to move this Summer, and didn’t think it would be very smart to put a lot of time, money, or energy into a piece of land that would no longer be ours in just six months’ time. It made me sad. Very, very, sad. March came and went without us ordering organic compost to till into soil already rich from three years of amendment and gardening. There was no sprinkling of lettuce, kale, carrot, or beet seeds; no elaborate map drawn to show the exact location of each plant to come. May 15th, the last frost date for our part of Virginia, rolled by without us spending a Saturday planting tiny tomato, cucumber and pepper plants. The weeds grew, and grew, and grew...and I just let them. Multiple friends who don’t know our plans to move, but do know the joy we get from growing our own food, have asked “how’s that garden of yours?”. This single question, innocent as it is, elicits a panicked look from Brian, who tries to change the subject before I can launch into our sorrowful (to me) tale. About how, no, we didn’t plant any vegetables in our backyard this year. And no, we don’t think we’ll be moving into a new house in time to establish a new garden. And yes, I am devastated that we’re not spending a portion of our weekends weeding and watering and planting and harvesting. Harumph. In hindsight, we should have planted summer veggies. Things never move as quickly as anticipated, and our putting the house on the market was no exception. By now we could have been eating our own lettuce, cucumbers, sugar snap peas, and beets. Instead we’re buying them at the farmer’s market, which is the next best thing, but still not quite as satisfying. I’m getting over it. Really. However...our berries have been AMAZING this year. Strawberries, red and golden raspberries, gooseberries, blackberries. Thank goodness for hardy perennial fruit that grows no matter the neglect it’s received! Those shots at the top of the page are from my visit to the garden last Friday morning, when I first noticed that the blackberries are starting to ripen. I did a little dance, hurried back inside for my camera and a bowl, and proceeded to pick every single fully-black berry on the vine. Happy, happy day. 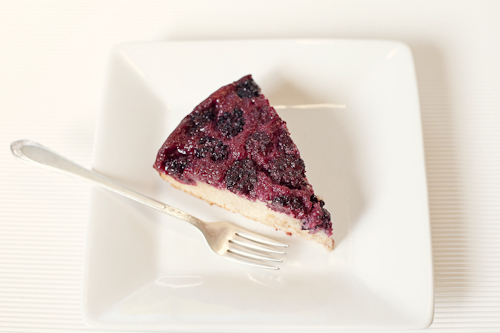 This cake was actually made with blackberries that we grew last summer and froze. We had 8 quarts in our own freezer, and many more were given to friends. I'm betting that our harvest will be doubled this year, and we're not moving until I am proven right. Stubborn? Not me. 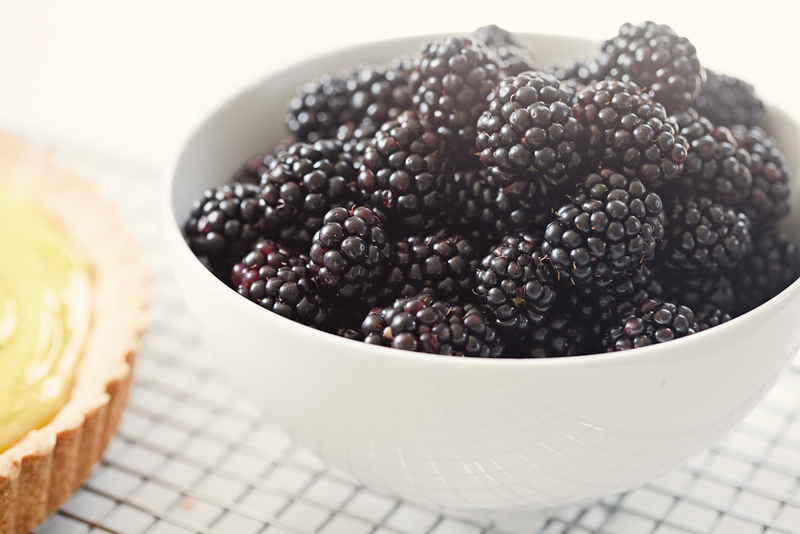 Even if you have fresh blackberries on hand, you should still freeze them for at least 4 hours before adding them to the batter. 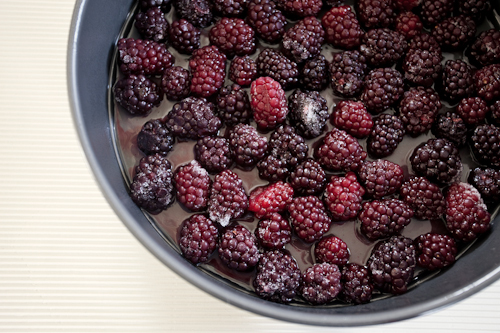 The frozen berries, with the help of the syrup, will stay firmly rooted to the bottom of the pan without rising to the top (which will become the bottom) of the cake. The whole wheat flour provides the cake with a dense crumb, perfect for picking up between two fingers. I made it for dessert, but I think it is even better for breakfast. 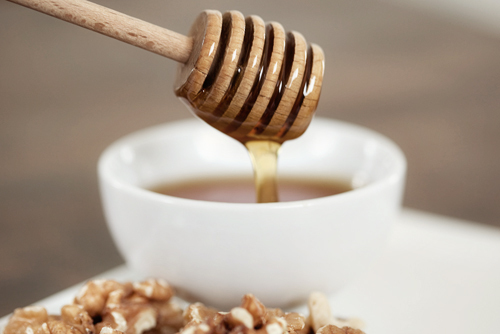 Not too sweet, hearty with whole grains, a nice compliment to a cup of coffee. Position a rack in the center of the oven and preheat the oven to 350 degrees. Spray a 10-inch ovenproof skillet or springform pan with vegetable oil spray. For the cake: In a medium bowl, using a handheld electric mixer at high speed, beat the egg whites until soft peaks form. Gradually beat in the fruit juice concentrate, beating until stiff peaks form. Reduce the speed to low and add the milk, oil and vanilla, mixing until well combined. In another medium bowl, whisk the flour, baking powder, and salt until combined. Add to the liquid ingredients and whisk until smooth. Remove the pan from the freezer and pour the batter over the fruit. 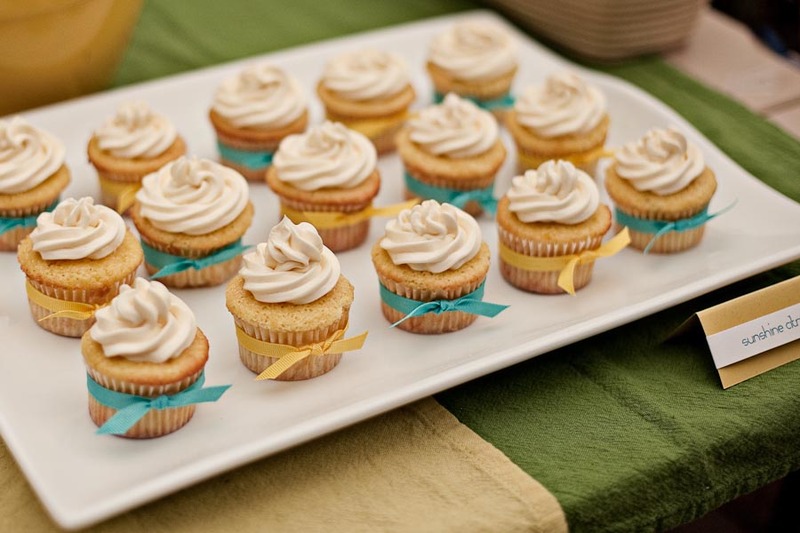 Bake until a toothpick inserted in the center comes out clean, 35 to 40 minutes. Cool on a cake rack for 10 minutes. 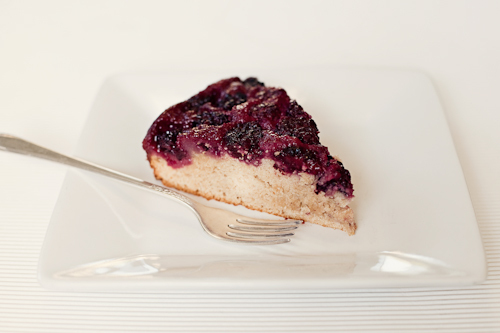 Run a knife around the inside of the skillet or springform to loosen the cake. Invert onto a serving plate. Let stand for 5 minutes so that the cake can absorb the juices. Remove the skillet of release the sides of the spring form and carefully lift off the bottom. Serve the cake warm or at room temperature. And so Brian and I hopped in the car that Friday and drove out to the country to fill a flat with ten pounds of bright and beautiful berries. Never mind the fact that we have a garden on the side of our house that is absolutely FULL of strawberry plants. Plants that have well exceeded their raised bed boundary and tumbled into the aisles of what was once a very organized patch. Plants that, during the time we were heading towards the orchard with windows down and music blaring, were completely covered with star-shaped flowers and tiny green fruit. 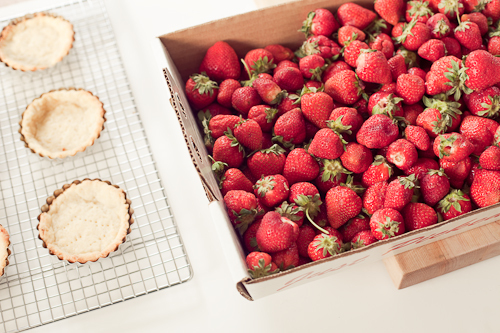 But those country strawberries, they were ready RIGHT THEN, and I just couldn’t wait another week for ours to ripen. There is something very special about moving slowly between those neat rows of plants, bending down to push emerald leaves aside, revealing the ripe and ready gems hiding in their shade. 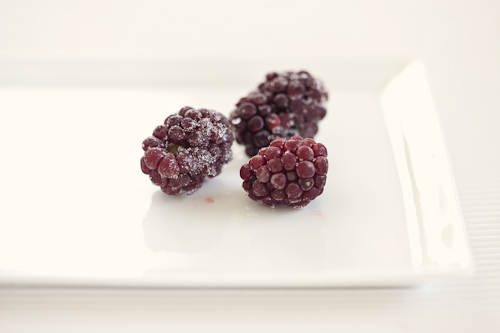 The berries come off their stems with the most satisfying "snap! ", and if popped in your mouth at that exact moment are one of the most delicious treats to ever touch your tongue. Warmed by the sun, the fruit seems to explode in the mouth as vibrant juice seeps into every nook and cranny. It is so overwhelmingly good that you must close your eyes, tilt your face up towards the sky and slip into a little food dance of happiness. Yes, I do that. Once home, I set to work finding recipes for our bounty. I thought about pie and jam and cobbler, but in the end decided that the berries were perfect just as they were. And so I rinsed them all and placed most in a large colander in the fridge, ready for breakfast yogurt and cereal, afternoon snacks and ice cream topping. The pint that I set aside was slated for tiny tarts, the raw berries sliced thinly and laid across a filling of cooked rhubarb within a crisp, buttery shell. The marriage of rhubarb and strawberry is timeless, like that of chocolate and peanut butter, or coconut and lime. One will never tire of the other, and folks will undoubtably continue to enjoy their combined company for years to come. 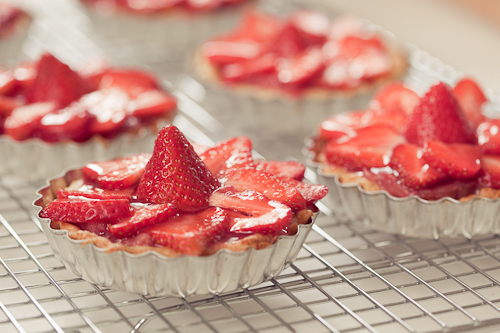 In these tarts, the rhubarb is cooked down in a process that resembles the making of jam, and the end result is quite similar to the classic jarred spread. The tartness of the rhubarb is gently subdued by the sugar it is reduced with, but still punchy enough to provide nice balance to the sweet berries. 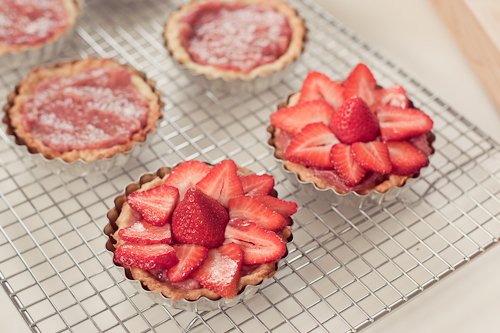 The best part of these tarts is the strawberries themselves, kept raw and firm and perfectly sweet on their own. 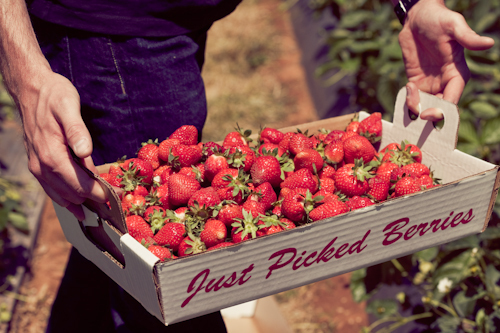 Find the freshest fruit possible and you can't go wrong. In a heavy saucepan, combine the sugar and water. Stir over medium-low heat until the sugar dissolves. Add the rhubarb, increase the heat, and bring to a boil. 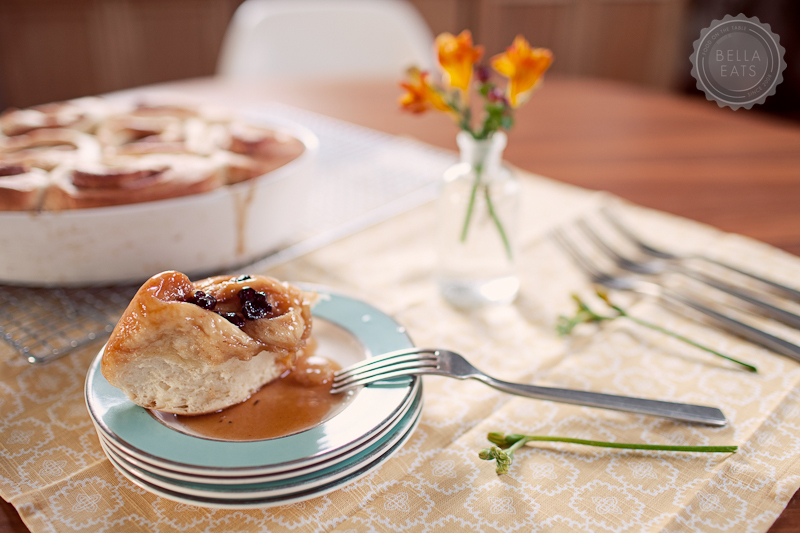 Reduce the heat to medium-low, cover, and simmer for 5 minutes, or until the rhubarb is just beginning to soften. Remove the pan from the heat. Let stand, covered, for 10 minutes, or until the rhubarb is tender. Set a mesh strainer over a medium bowl and drain the rhubarb, reserving the liquid. Allow the rhubarb to cool completely. In a small saucepan, simmer the reserved liquid over medium-low heat for 5 minutes, or until it is reduced to a thick syrup. Set the syrup aside and allow it to cool completely. Meanwhile, wash and hull the strawberries. Thinly slice the strawberries lengthwise. Spread the cooled rhubarb evenly over the bottom of the tart shell. 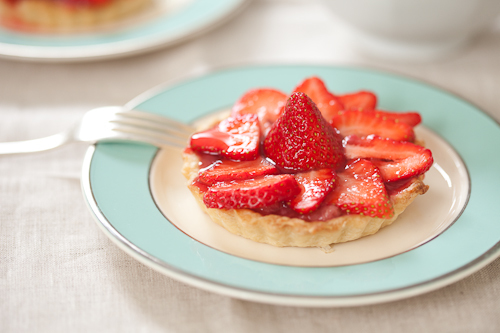 Arrange the strawberry slices in concentric circles over the rhubarb filling, covering it completely. 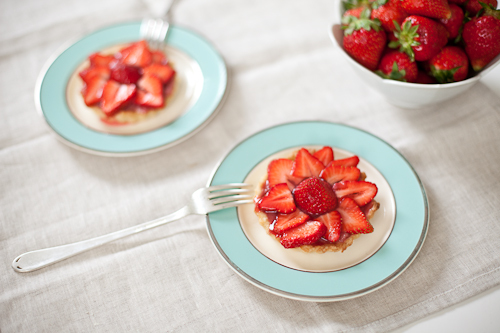 Brush or spoon the cooled syrup over the top of the strawberries. Chill before serving. In a bowl, whisk together the flour, sugar, and salt to blend thoroughly. Using a pastry blender, metal pastry scraper, two knives or your fingers, cut or rub the butter in the dry ingredients until the mixture resembles a coarse meal. Using a fork, stir in the water, 1 tbsp at a time, adding just enough for the dough to hold together without becoming wet. Gather the dough into a ball and then flatten it into a disk. Wrap the disk of dough in plastic wrap and chill for 1 hour. Remove the dough from the refrigerator. Using a rolling pin on a lightly floured board, roll the dough to form a rough circle about 1/4" thick. 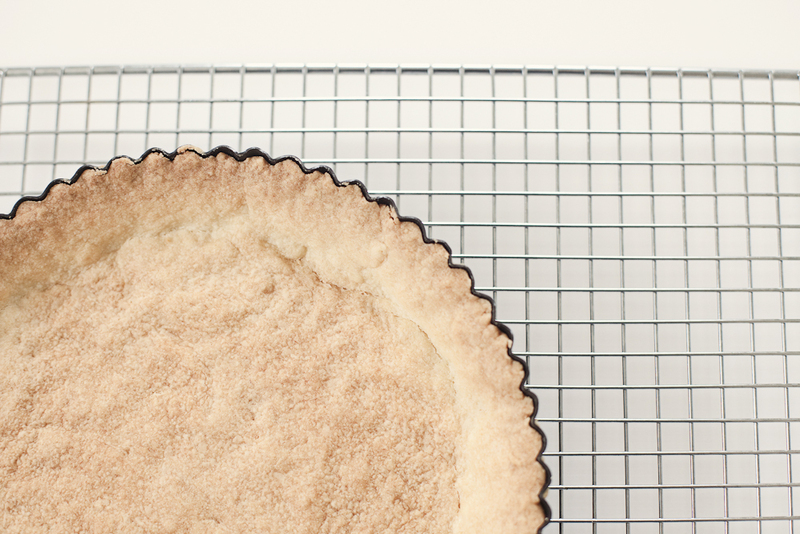 Carefully transfer the dough to a 9" fluted tart pan (or six 4" pans) with a removable bottom. Press the dough lightly but firmly into the edges of the pan, allowing the excess dough to hang over the edges of the pan. 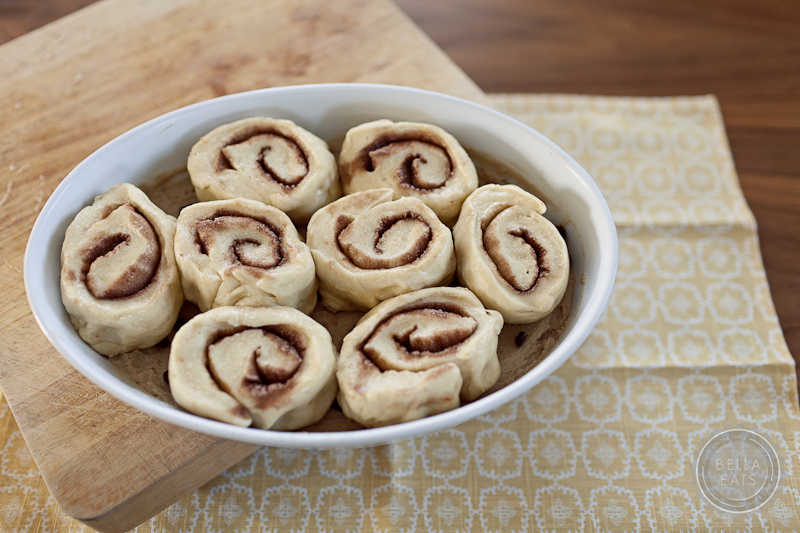 Roll the rolling pin over the top of the pan to trim the excess dough from the pan rim. 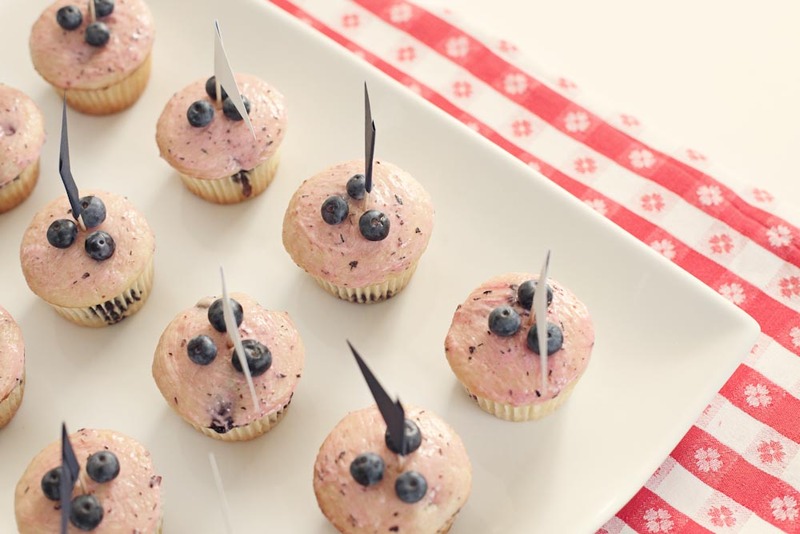 Pierce the bottom of the dough several times with the tines of a fork. Chill for at least 30 minutes before baking. Position a rack in the center of the oven and preheat the oven to 400*F. Line the chilled shell with foil or parchment and fill with pie weights, dried beans, or raw rice. Bake the shell for 12 minutes, or until the pastry is set and golden. Carefully remove the foil or parchment and weights and continue to bake the shell another 10 to 15 minutes (a little less if you use the smaller pans), or until the pastry is golden brown. If the edges start to brown too much, cover them with strips of foil or piecrust shields. Cool on a rack. Hello friends. Things have been a little bare around here lately, haven’t they? I am having a hard time believing that April slipped by with only two posts on Bella Eats. Two posts? How did that happen? We’ve been cooking and eating, I assure you, and I have a long list of recipes that I was planning to share last month. The photographs are all edited, and most are even loaded into drafts in my Wordpress dashboard. So what, you ask, is the deal? I’ll spare you the list of excuses because really, what it comes down to, is that life is just plain busy. I’ve tried my best to become a very good juggler, to keep all of the plates soaring high above my head with a flick of my wrist and the occasional impressive behind-the-back catch but, alas, one of those plates fell. The Bella Eats plate is a tough one to keep in the air when time is running short at the end of the day, mostly because of the words that accompany each meal that I share here. My time for writing comes after work, after running and yoga, after dinner and dishes, after free-lance photography edits and marketing projects. Lately when that time is upon me, the time to sit behind my computer and let the words seep from the well in my brain, down my arms and out through my finger tips...I find myself with an empty well. And so I go to bed. I cuddle in next to Brian with the sheets wrapped around my shoulders and two dogs crowding my feet. The ceiling fan whirs overhead and I attempt to match my breath to its subtle rhythm, incorporating techniques from my yoga practice in an effort to fall asleep as quickly as possible. But my mind, the mind that failed me for an entire hour prior to my giving in and coming to bed is now racing. There are 'to do' lists and emails to write and recipes and workout plans swirling around on their own paths, making a terrible knot of jumbled thoughts that only the clarity of morning will untangle. When sleep finally overtakes my body it is not without its own side effects. Suddenly my mind, not deterred by slumber, has all kinds of ideas about writing and work and life, weaving intricate stories through my dreams that are exciting and fascinating and inspiring. The scenes are so vivid that I find myself waking up multiple times in the night, tossing and turning as characters new and familiar wind their way in and out of predicaments that oh-so-loosely resemble my waking hours. I find myself hitting 'snooze' on the alarm multiple times each morning, trying to catch the tail-end of these thoughts before they fizzle out and leave me with only a hazy shadow of something that I think, maybe, if I could just remember, might have been good. It seems that this is the only time I have for creative wandering, the only time not bogged down by obligations and responsibility. I relish in it, until I realize the time and jump from bed in a panic, beginning the daily process all over again. These extended 'snooze' sessions have caused me to rely heavily on grab-and-go breakfasts. The kind that, after hastily rising from bed and jumping in the shower, darting around the house looking for this shirt or that shoe, feeding dogs and packing a lunch allow me to simply reach into the freezer or pantry for a single item to stash in my bag and eat at the office. Gone are the mornings of leisurely breakfasts that involve turning on the oven and dirtying a pot, bowl and spoon. 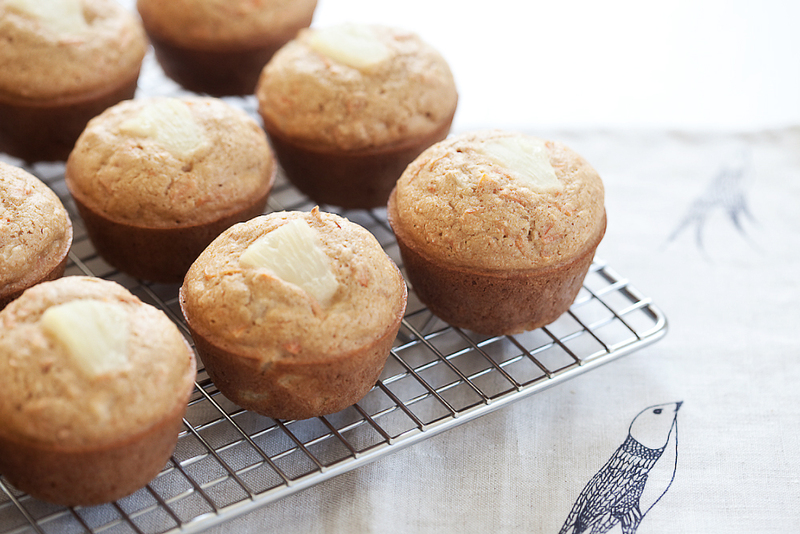 These days I am simply happy that I thought to freeze the leftover Carrot and Pineapple muffins I made weeks ago, and hopeful that soon, very very soon, my schedule will slow down to its normal pace. I am ready for that Bella Eats plate to soar again, to form high arcs above my head as words flow from my fingertips into this little space on the 'net. Until then, thanks for being here. I am so happy you're reading. 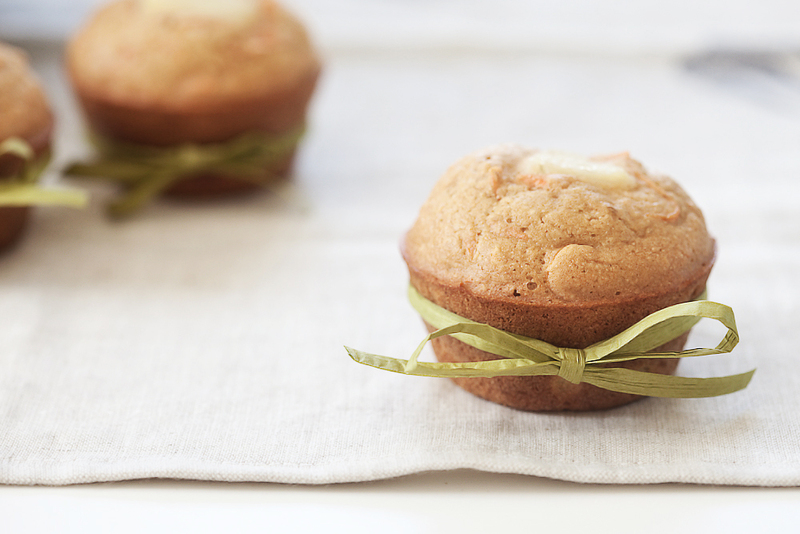 These muffins are incredibly moist, even after a 3-week stay in the freezer. They have a hearty crumb fortified by the whole wheat flour, and a subtle sweetness provided by the pineapple and the agave nectar. I find them quite filling when paired with a piece of fruit or a cup of yogurt for breakfast. Preheat oven to 350*. 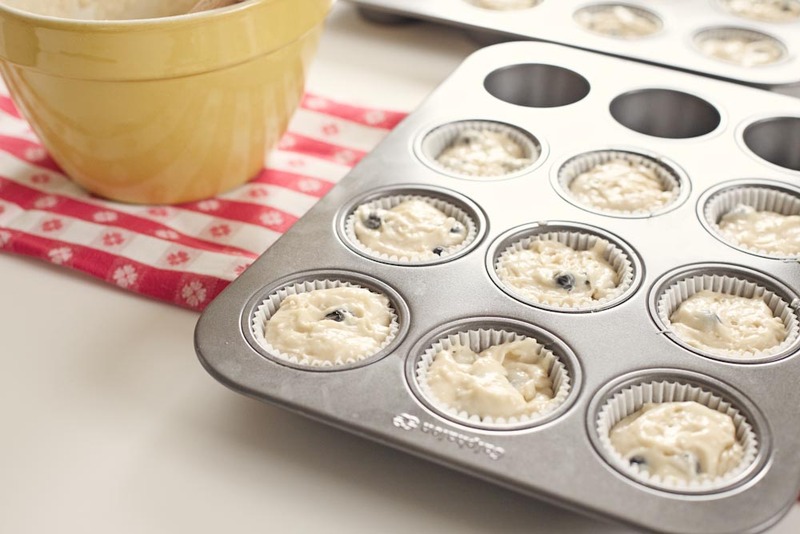 Lightly spray a standard 12-cup muffin pan with vegetable oil spray. Sift together the flour, bran, baking soda, cinnamon, ginger and salt into a medium bowl and make a well in the center. In another medium bowl, using a handheld electric mixer set at high speed, beat the egg whites with all the agave nectar until soft peaks form. Reduce the speed to low and gradually beat in the milk. Pour into the flour well and stir with a wooden spoon just until combined. Stir in the carrots and the diced pineapple. Spoon the batter into the muffin cups, filling about 3/4 of the way full. 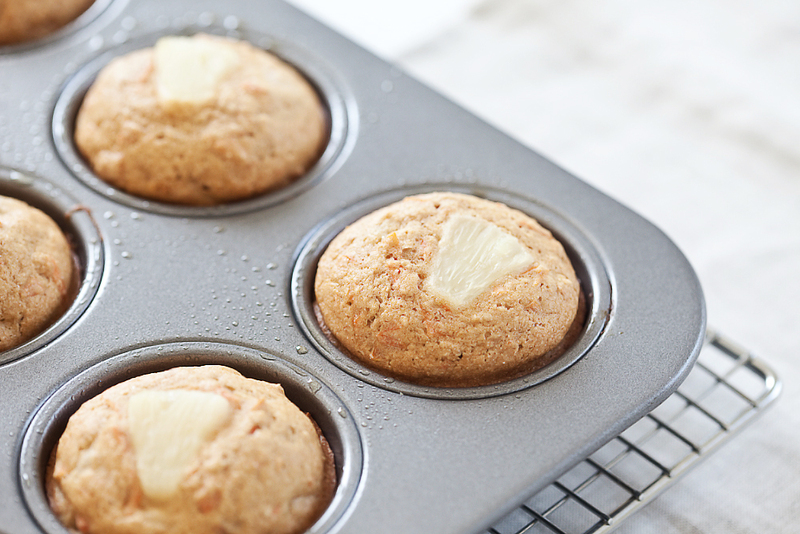 Top each muffin with a pineapple chunk. 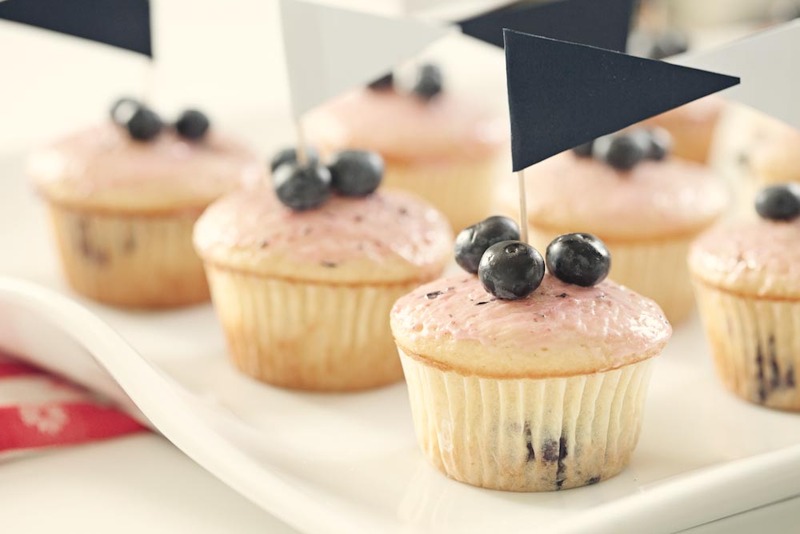 Bake the muffins until a toothpick inserted in the centers comes out clean and the tops spring back when pressed with a finger, 20 to 25 minutes. Cool for 2 minutes, run a knife around the inside of the cups to release the muffins, and remove from the cups. 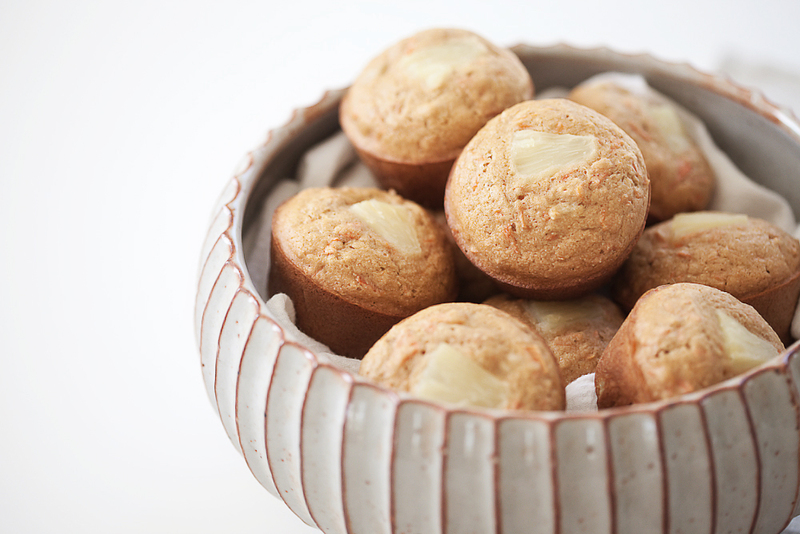 Serve the muffins warm or at room temperature. 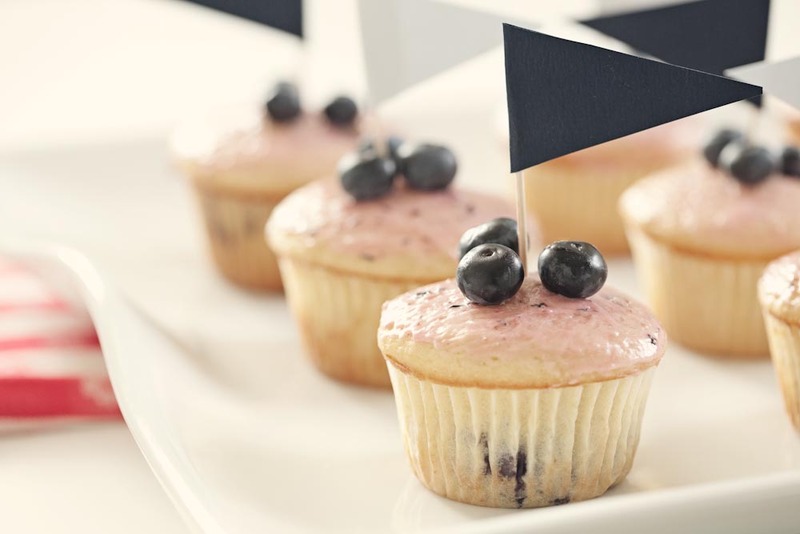 To freeze, wrap each muffin individually in plastic wrap or aluminum foil. 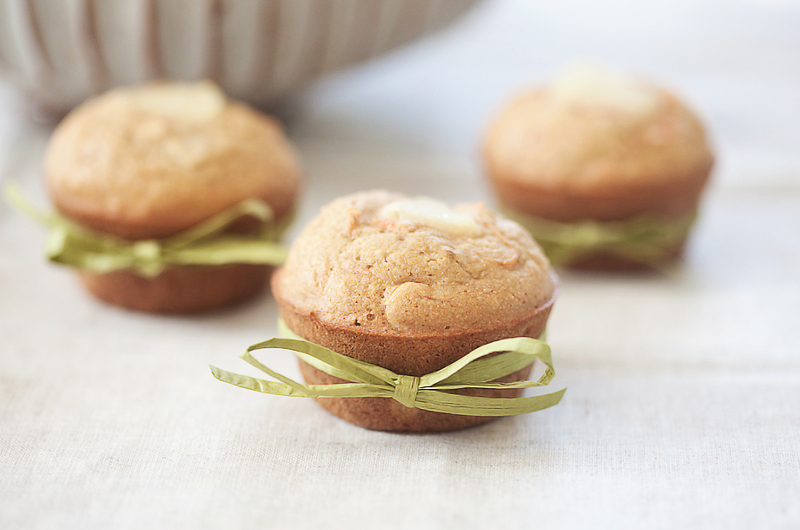 Place the muffins in a Ziplock bag in the freezer. They should keep for up to 3 months. 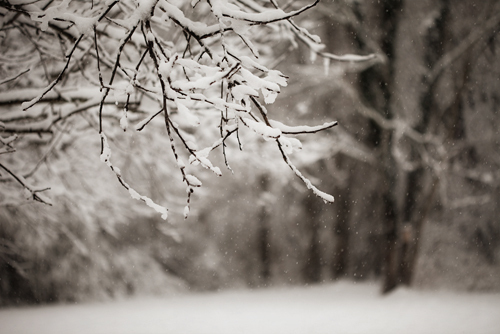 Last week, while sharing lunch with a friend, standing in line at the post office, answering phones at work, passing a stranger on the sidewalk, Charlottesville folks were discussing snow. Big snow...at least for our little city. 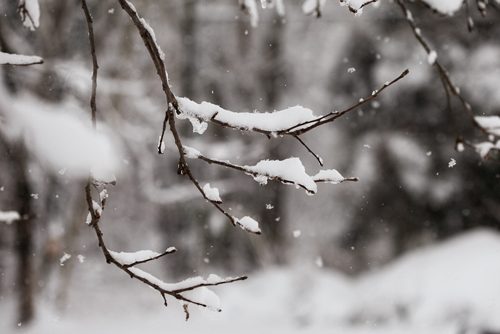 The forecasters were predicting another huge storm, rumored to rival the December 19th event that pushed its way into the #4 slot on Charlottesville’s list of historic snowfall totals. It was all very exciting, and a tad bit scary. We were warned of the heaviness of this snow, expected to be so much wetter than the last accumulation. We were told to prepare for power outages and potential roof collapse, to be ready to spend days in our homes and to have the supplies required to get us through that time. The city was a flurry of activity (ahem...pun intended) as residents scrambled to buy stores out of their supply of milk, eggs, and toilet paper. Snow shovels were a hot commodity, with those shops that managed to receive shipments putting a one-shovel-per-customer limit on purchases. We bought ice melt and candles, bread and cans of tuna, charcoal for our grill and meat and potatoes to place over the flame should we lose power and the use of our oven. We settled in, prepared for the worst, ready to weather the storm. In the end we wound up with nearly 15 inches of snow, 10 inches less than predicted after sleet clinked against our windows and prevented substantial accumulation for most of Friday night. We were lucky enough to lose power only once, and then for only an hour. Although the city did a fine job of clearing primary roads during and after the storm, we still chose to remain at home, warm and cozy, for the entire weekend. Brian and I have become quite adept at preparing for long periods of isolation in our house. We stock up on the necessities already mentioned, along with certain items that help to keep us entertained and pass the time - wine, multiple disks of Entourage, magazines and books, baking supplies. The last is the most important for me, as I take comfort in the fact that even if the sky were to dump 48 inches of snow across our lawn and we were to lose power for 7 full days, I could still make bread and cookies in our Big Green Egg. Also, I really like to bake, and the thought of three, uninterrupted days to do so makes me very, very happy. And so, along with the necessary non-perishables and paper goods, my grocery bags contained milk and eggs, flour and yeast as I left the market Thursday afternoon. I browsed through my cookbooks that evening, imagining each one of my mixing bowls tucked into various corners of the kitchen, plastic wrap stretched tight across their tops, plump balls of dough slowly rising within. 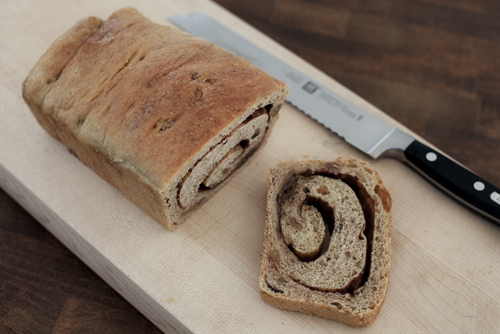 Brian requested something sweet, a dessert-ish bread to smear soft butter across as an after-dinner snack. Not one to ever pass on the suggestion of something sweet, I dove right into thoughts of a bread swirled with cinnamon and sugar, laced with figs and walnuts, the crumb sweetened by a touch of honey. The loaf I was hoping for emerged from the oven just as the snow started to lighten Saturday evening. The intoxicating mélange of fresh-baked bread, sultry cinnamon, earthy walnuts and syrupy figs will forever bring to mind the vision of a silver-cloaked sun setting behind frosty trees, their limbs glimmering with a mask of tiny diamonds. A lovely ending, indeed. Dissolve the honey in the buttermilk by heating both over low heat. Allow to cool to room temperature. Sift together the flour, salt, yeast and cinnamon in a large mixing bowl. Add the egg, shortening, buttermilk mixture and water. Stir together with a large spoon (or mix on low speed in a stand mixer with the paddle attachment) until the ingredients come together and form a ball. Adjust with flour and water if the dough seems too sticky or too dry and stiff. Sprinkle flour on a counter and transfer the dough to the counter. Knead (or mix on medium speed with the dough hook). The dough should be soft and pliable, tacky but not sticky. 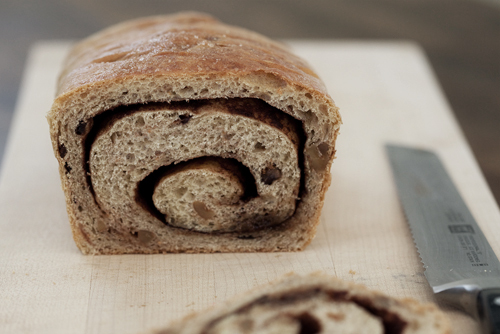 Add flour as you knead (or mix), if necessary to achieve this texture. Knead by hand for approximately 10 minutes (or by machine for 6 to 8 minutes). 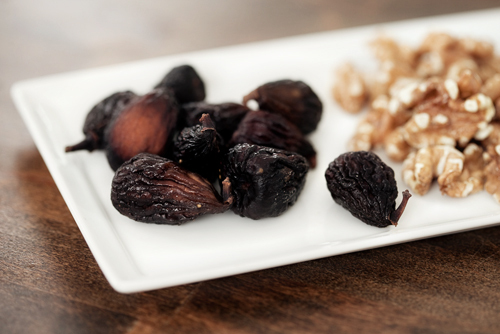 Sprinkle in the figs and walnuts during the final 2 minutes of kneading (or mixing) to distribute them evenly. If you are kneading with a mixer, you'll want to finish kneading by hand to avoid crushing the figs and walnuts, and to be sure to distribute them evenly. Lightly oil a large bowl and transfer the dough to the bowl, rolling it to coat it with oil. Cover the bowl with plastic wrap and allow to ferment at room temperature for approximately 2 hours, or until the dough doubles in size. Mix together the 1/2 cup turbinado sugar and 2 tbsp ground cinnamon. Set aside. Butter two 4x8 loaf pans. 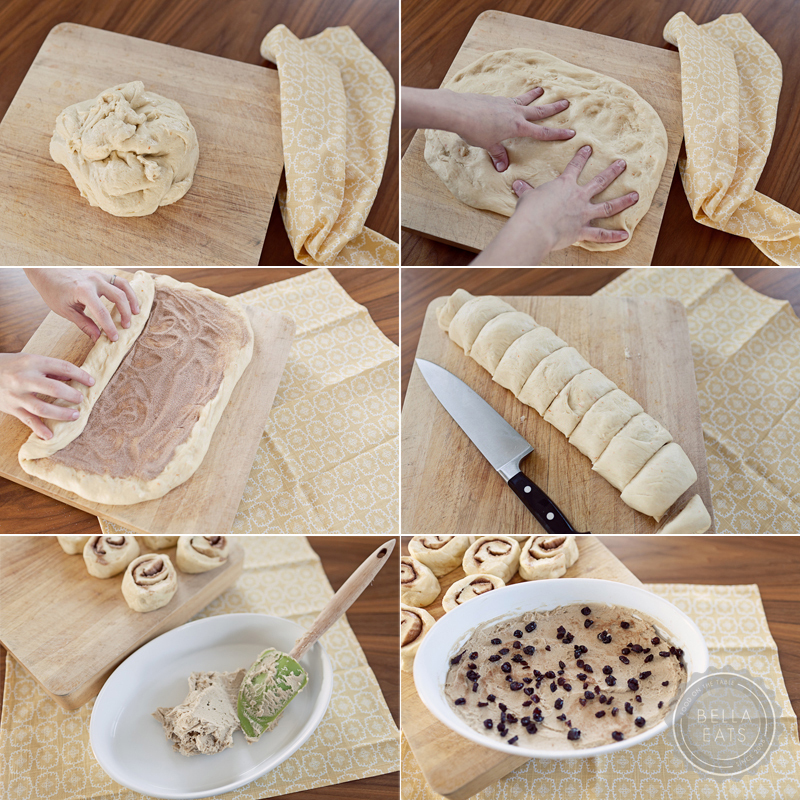 Divide the dough into 2 equal pieces. On a lightly floured surface, roll one piece into a 5x8 rectangle. Sprinkle half of the cinnamon sugar mixture over the dough, leaving a small border around the edge of the dough. 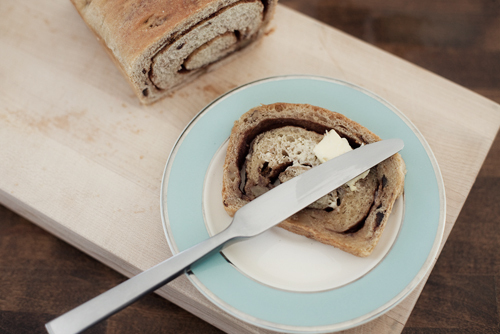 Starting at the short end, carefully roll the dough into a tight log*, sealing the seam as best you can. Tuck the ends up towards the seam, sealing as best you can. Place the log in a buttered loaf pan, seam-side down. Repeat with the second piece of dough. Spray the tops of the loaves with spray oil and cover loosely with plastic wrap. Place in a warm, draft-free location to proof for 60 to 90 minutes. Preheat the oven to 350* with the rack in the middle of the oven. 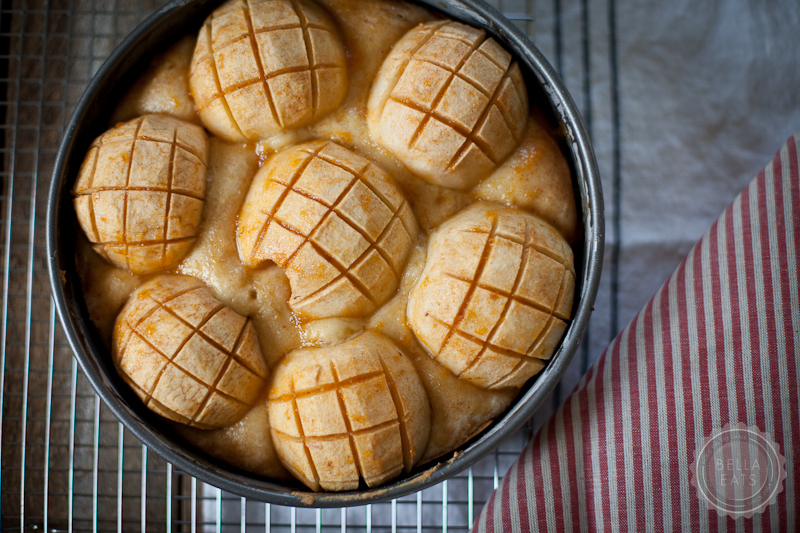 Uncover the loaves and brush the tops with melted butter. Sprinkle the tops with turbinado sugar. Bake the loaves for 20 minutes. Rotate the loaf pans 180 degrees and continue baking for another 20 to 30 minutes, until the loaves are golden brown on top and lightly golden on the sides and bottom. They should make a hollow sound when thumped on the bottom. Immediately remove the loaves from their pans and cool on a rack for at least an hour before slicing and serving. *I'm guessing that my loaf pulled apart along the swirl because it wasn't rolled tightly enough. It is still perfectly textured and delicious, the slices just don't hold together well as you bite into them. The landscape during and after a winter storm is an amazing sight, always changing, different from one minute to the next. 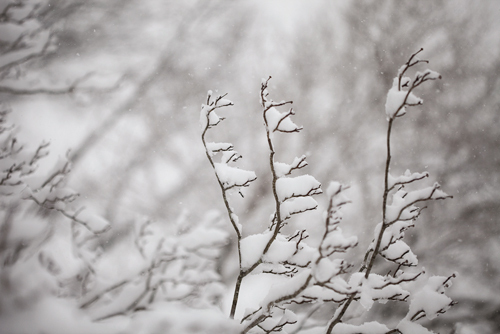 Every few hours I piled on layers of warmth, tucked my jeans into my boots, forced a hat over unruly hair, and trudged outside in the swirling snow to capture some of the magic. Coconut and Lime. A combination that brings to mind a stretch of white sand, bright hot sunshine, palm trees swaying in a warm ocean breeze, the scent of sunscreen permeating salty air. From the vantage point of a low-seated, brightly-striped beach chair I can see the topaz water spread before me, a lovely backdrop for my fuchsia-coated toenails. On my right a fruity cocktail with a lemon-hued umbrella waits patiently for my next sip. In my lap rests a delightful book, set aside for a moment while I take in the view before me. A tropical island. Are you with me? I hope so. Pull up a chair, apply your sunscreen, grab a drink and settle in for a nice long chat. We need this, don't we? A respite from gray skies that threaten to pour ice and snow over grass that has just recently emerged from underneath the last snowfall. An opportunity to replace bulky sweaters, scarves and overcoats with swimsuits, gauzy tops and sandals. An excuse to make Mojitos and Margaritas instead of Hot Toddies and Irish Coffee. If only I could escape to such a place. Right now. Just hours before the first few flakes of the impending snowstorm start to fall. Unfortunately, neither my bank account nor my work schedule can afford such a jaunt to the South at a moment's notice. Instead, I pushed my weekly grocery trip up by one day, stocking up tonight on items needed for a Saturday to be spent testing recipes as snow softly falls outside the kitchen window. Rather than a polka-dot bikini and broad-rimmed hat I'll be shuffling around in slippered feet and comfy sweats. On the agenda? Spicy sausage and potato soup, some sugar cookies, a chickpea salad. All are good cold weather fare, but I can't help but think that maybe I should be thinking a little differently. 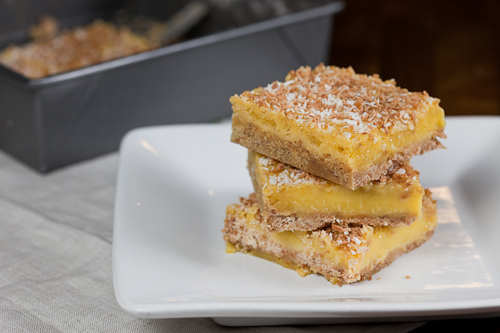 That maybe I should be whipping up another pan of these Coconut Lime Bars that cured my Winter woes two weeks ago. 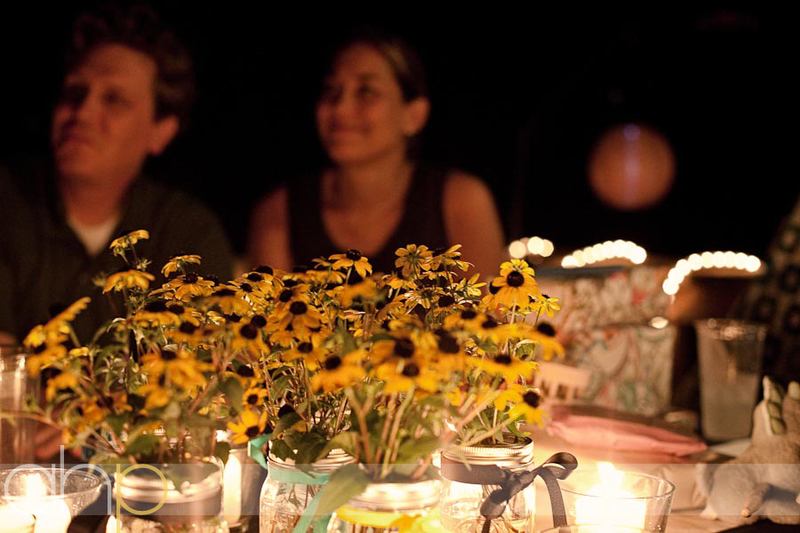 How does a tropically-themed dinner party in the middle of Winter sound? That's not such a bad idea, is it? We'd gather some friends, make a pan of enchiladas, a bright salad, some guacamole, and a tangy citrus dessert. We could pull the last few limes off of our little indoor tree (the only way citrus could possibly survive a winter in Virginia) and shake up some zippy margaritas. I'll load the iPod with Jimmy Buffett and Bob Marley and turn the heat way up. We'll chat about food and travel and books until the 'ritas kick in and folks start climbing on my dining table to belt out "one love...one heart...let's get togeeeeether and feel alllll right!" with their arm slung across their neighbors shoulder for support. And nobody is allowed to mention the snow outside. Nobody. Would you come? I hope so. These bars might just be worth your trip. I made these gluten-free and dairy-free for a friend that shared them with us two weeks ago. Feel free to substitute all-purpose flour and regular butter for my ingredients. Preheat oven to 325* and butter and flour an 8-inch square baking pan, knocking out excess flour. In a medium-sized bowl blend together flour, butter substitute, 1/3-cup coconut, confectioners' sugar and salt until mixture resembles coarse meal. Pat mixture into prepared pan and bake in middle of oven for 25-30 minutes, or until golden brown. Allow to cool for 10 minutes before pouring custard in. Reduce oven temperature to 300*. In a medium bowl whisk together eggs and granulated sugar until combined well. 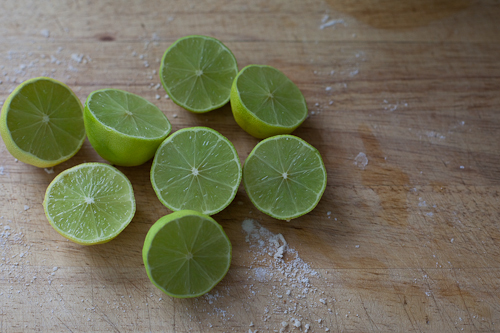 Stir in flour, lime juice and zest. Pour mixture over crust and bake in middle of oven for 20-25 minutes until just the center of the custard is not set. 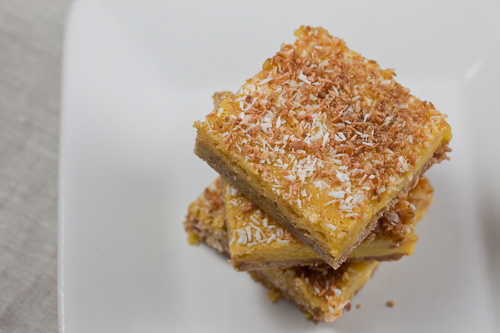 Top custard with 1/3 cup toasted coconut and bake for an additional 5-10 minutes until all of custard is just set. Cool in pan on rack for 1 hour, then chill in refrigerator for 1 hour before serving.